Background: Here, electrospun fibers based on a blend of polycaprolactone (PCL), poly(ethylene glycol) (PEG), and gelatin methacryloyl (GelMA) were developed. The careful choice of this polymer combination allowed for the preparation of a biomaterial that preserved the mechanical strength of PCL, while at the same time improving the hydrophilicity of the blended material and human osteoblast maturation. Methods: The morphology, chemical structure, wettability, and mechanical properties before and after UV photocrosslinking were evaluated. Furthermore, human osteoblasts (hFOB) were cultivated for up to 21 days on the scaffolds, and their potential to upregulate cell proliferation, alkaline phosphatase (ALP) activity, and calcium deposition were investigated. Results: Contact angle measurement results showed that the developed scaffolds presented hydrophilic properties after PEG and GelMA incorporation before (25°) and after UV photocrosslinking (69°) compared to pure PCL (149°). PCL:PEG:GelMA-UV displayed a slight increase in mechanical strength (elastic modulus ~37 MPa) over PCL alone (~33 MPa). Normally, an increase in strength of fibers leads to a decrease in elongation at break, due to the material becoming less deformable and stiffer, thus leading to breaks at low strain. This behavior was observed by comparing PCL (elongation at break ~106%) and PCL:PEG:GelMA-UV (~50%). Moreover, increases in ALP activity (10-fold at day 14) and calcium deposition (1.3-fold at day 21) by hFOBs were detected after PEG and GelMA incorporation after UV photocrosslinking compared to pure PCL. Ultrathin and hydrophilic fibers were obtained after PEG and GelMA incorporation after UV photocrosslinking, but the strength of PCL was maintained. Interestingly, those ultrathin fiber characteristics improved hFOB functions. 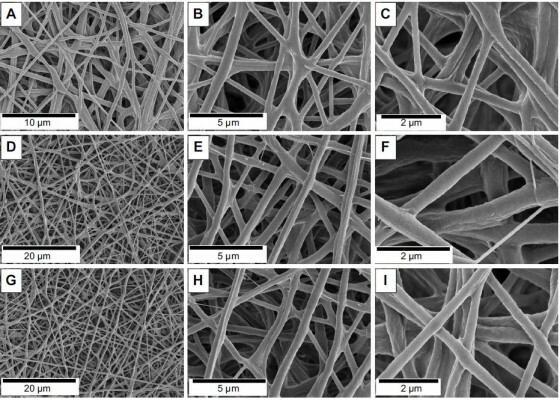 Conclusion: These findings appear promising for the use of these electrospun scaffolds, based on the combination of polymers used here for numerous orthopedic applications.